WebCam Monitor requires an Internet connection for Remote Monitoring options like Broadcasting and Upload or for the E-mail Notification alert. If you connect to the Internet via a proxy server then you must configure it in WebCam Monitor to broadcast, upload or send an e-mail. 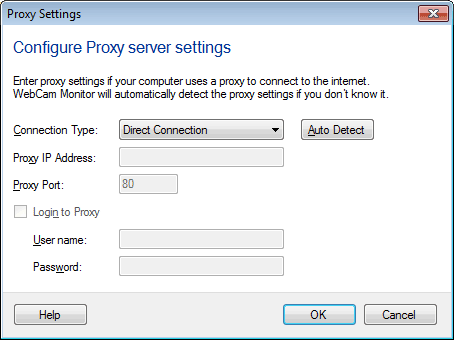 To configure the proxy server, click FTP Upload >> Configure upload settings >> Add / Edit >> Configure Proxy Settings. By default, the connection type is set on Direct Connection. If you do not know the proxy details, you can click on the Auto Detect option. If that does not work, then you may need to contact your Network Administrator for assistance. After you have the proxy details, you can enter the Proxy IP Address and Port number. Note: If you are using E-mail Notification and connect to the Internet via a proxy server, use an IP address as the mail server, not a domain name. Providing a name like "mail.server.com" may not work when using a proxy, because WebCam Monitor may not be able to convert it into an IP address. In some cases, you may also need to check the Login to Proxy option and specify the User Name and Password to connect to the server.